10 little piggies and counting ... This is Gonna Be FUN! The first group ride begins in just ten days ... WooHoo! It has been raining a lot! This is going to be interesting indeed! It is suppose to snow and rain the day before we go! I was going to camp/tent but the temps for both those nights is about 2 degrees above freezing. Lumberjack here has a ToyHauler and is passing thru Nashville on his way to the ride. So, I'm throwing my bike in his garage as he passes by. When we get there the bike gets kicked out and the garage becomes my comfy warm bedroom for the night. It looks like we have about 20 peeps confirmed going and about seven cameras rolling! I'm gonna get some good laughs outta this when I get home and start watching everything I missed while trying to stay "this side up"
ELAD! ... Wow, you rode that big BMW thru all that mud like you were on a bike one third its weight! Its gonna take me a while to edit up to some of your mud bogging ... (HA!) ... I'm getting a kick out of culling thru it all. That was one ride that just about ticked off every box of obstacles out there! JonBu, mr_10brook, Mofo Flake and 1 other person like this. Man you did a great job on that bike! It was controlled chaos with a permanent grin! ... NICE! Hey Elad, can I use that photo in the video? I was constantly impressed that you were doing so well on that worn out rear tire. What a good looking bike too. JonBu, Platypus-3in1 and Elad like this. I do need to change that tire, y'all were zipping pretty good too. Platypus-3in1 and Mofo Flake like this. Mofo Flake, JonBu and Platypus-3in1 like this. Mofo Flake, Elad and Platypus-3in1 like this. The LTaR (Let’s Take a Ride) Spring Ride was an epic jumping off to the 2019 riding season. Let us name it “Ridin’ the Line” as we were literally on the Alabama – Tennessee State line most of the day. It was cold, muddy, wet and awesome! Hopefully I can give you a little insight into the ride here. But first for some backstory. 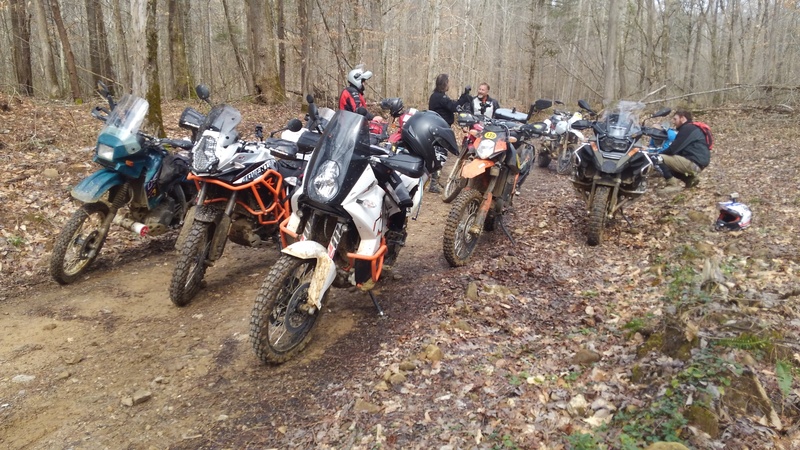 Last spring I met David Baird after the Tennessee Dual Sport Southern Discovery Spring Rally when he announced that he was inviting some folks to ride some double secret tracks the TDS organizer Casey Hampton had given him. The meetup was to be in Centerville, TN. I didn’t know anyone or what to expect and I am not sure David did either. I showed up and introduced myself to David over a cup of coffee. Jerry Wayne Burke arrived next, then Dave Sabo and bringing up the rear was Briley. We headed off on some wild exploration that turned into a real adventure that day. David was filming and I had my gopro on as well. Everyone had so much fun and enjoyed the short video clips, we decided to do another ride. 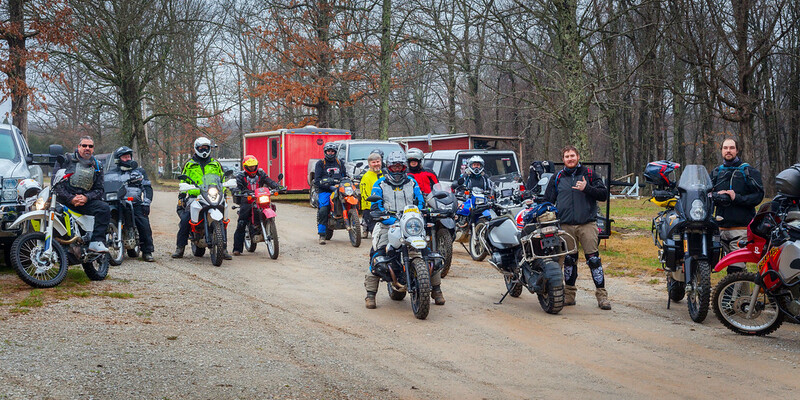 Our next and first “official” ride was one I organized at Franklin Forest. We had a much bigger group and the comraderie, the gelling of the participants, the overall FUN factor was all there. After the ride, all we could talk about was how much fun we had and when can we do it again. During the meantime, there was some impromptu rides as friendships formed and the riding season progressed. I was busy trying to scout out the next ride which would be Catoosa in early fall followed again by the Southern Discovery Fall rally to close the season. 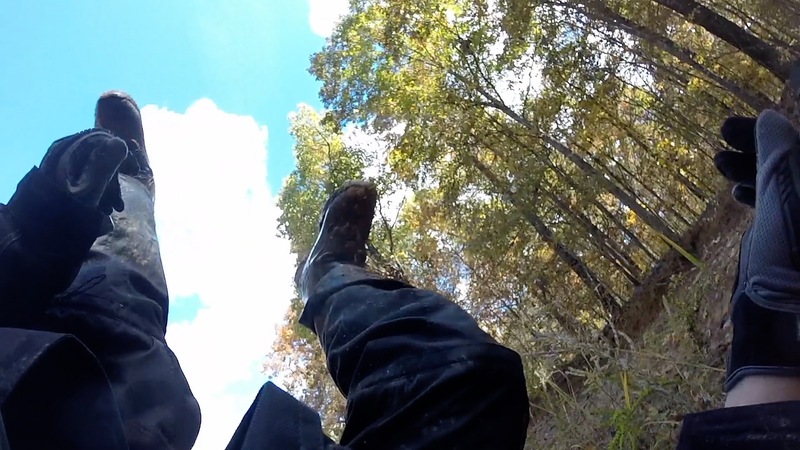 Now for this epic ride…back in the spring, I was on my way up to Franklin Forest for a ride. In Sewanee, two riders on Kawasaki KLX 250’s passed by me at an intersection heading in the direction I as going. I followed them and sure enough, they were headed to Franklin Forest as well. I introduced myself, met David Dodd and his brother in law. They recognized my bike (a battered and well worn ’99 KLR 650) from Facebook and we began talking riding and places to go. David mentioned a place on the Al/TN line that was only open from Oct. 1st until May 1st. This planted a seed. Shortly thereafter, Briley accompanied me to a rode in the general vicinity that I knew about and had explored briefly. We rode it not knowing where it would lead to but low and behold, we ended up well into Alabama in a cove that was remote. We saw all the woodlands undeveloped on both sides high up on the mountain and knew there was potential there. Another seed was planted. Fast forward to late summer and I began chatting online with Sammy Lance who also knew these roads as he grew up riding jeeps, 4 wheelers and now dual sports up and down the mountain. We made plans to meet and decided this would be a spectacular place for a ride. The groundwork was laid and we spend all fall and part of the winter exploring the route. Best laid plans don’t always work out like we want. All the rain this winter was concerning. I teased David Baird with a small section after 2 weeks of rain and the roads were almost impassable. Down could be done but not up. A few weeks later the ground was a bit drier and I took Briley on a pre-run. Perfect conditions! There was just enough greasy mud to make it interesting in places. It had it all! Red clay, green clay (yes, green clay! ), mud, dirt, rocks, monster hill climbs, descents (1200’ on average) and some great whoops to get the bikes airborne (numerous water breaks provided this). Briley even blew out a front fork seal. We were ready, or so we thought. The next 2 weeks were some severe flooding all across TN and AL, especially in this area. However, we had 3 dry days confirmed leading up to the weekend. But then on Friday, it rained again. We didn’t know how bad it would be, or how great it would be. The usual crew showed up along with some other folks that some of us knew but not all of us. Fantastic as we just expanded our riding network! The Crew: David, Ronnie, Jerry (#thebrez), Super Dan, Steve, Briley, Tammy (my wife), Matt, Kyle, Briley, Sammy and myself. Joining us was Richard, Jack, Chris and Roger. Sammy’s friend Dustin joined us on the route later in the morning. As we headed out, wheelies were popped and engines were revved. Bikes ranged from a DR200 up to a BMW GSA and everything in between. 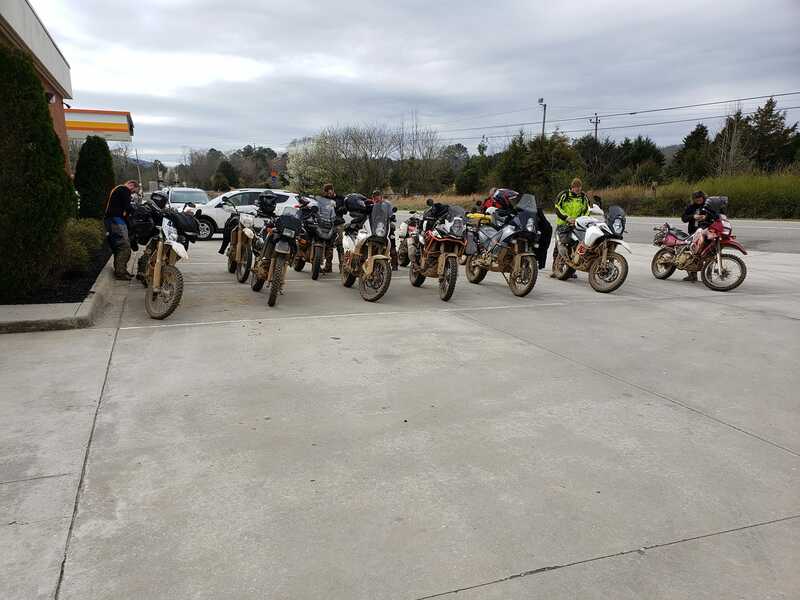 KLR’s reigned supreme followed by several KTM 990’s, a 950 super enduro, an 1190 and a 3 husky’s. As we crossed the state line on dirt, there were mud holes but nothing too severe. Then we began to go down the mountain. Here is the thing; you never know the conditions of the roads as it depends on how much traffic has been on it creating havoc. Going down was pretty darn muddy, challenging and greasy. As I lead, I tried to keep a quick pace but Richard and Jack were itching for some more speed and were on my tail. We had some true A+ expert riders in the group. Former racers ready to flex those old racing memory muscles. At the bottom we crossed some creeks and stopped to let the others catch up. This proved to take a bit as some struggled more than others. Certainly the road was getting worse for the riders in the rear as the front bikes with their knobbies tore up the lines. Once we started off, we began our climb back up. It started off fast with some jumps but as we started to climb more in elevation, we hit some steeper sections and conditions went from bad to worse quickly. I knew to maintain as much momentum as I could but my rear end was extremely loose from the clay packing my tire grooves. Richard and Jack went by me as they wanted to maintain there momentum. We climbed and made it up to the top with some really challenging sections. Chris on his 950 super endure passed me but at this one section, he got off camber and fell over into this clay mud hole that was thigh deep. It took four of us to lift that bike up. We managed to help the few of us that were there through as there was only one line that was doable. At this point, Dusting showed up and his 501 became stuck going downhill. That is how muddy it was. I went ahead and found Richard and Jack but after a while, we realized no one was behind us. I went back to find out. It was the hole. We helped and guided each through and shortly thereafter the rest of the crew came up. The road was getting progressively worse and we all pitched in to offer assistance of some sort. After the mud pit, the road leveled off and we hit some logging roads that were in decent condition. Everyone laid into the throttles and off we went with speeds reaching 60+mph! This was some fun riding that took us all the way down the mountain. From here, a long break was taken allowing everyone to catch up. Lunch was on the agenda. It was at this point I left the group, to rejoin later. My wife had hit a physical barrier due to all the mud and exhaustion was setting in. She was running 50/50 street/dirt tires and they just were not cutting it in the mud leading to extreme exertion of energy fighting that bike up the mountain. She fought it though like a true super trooper never giving up and determined to concur it. Coming down the mountain weariness kicked in and that was it. We had not really had a breakfast and it was way past lunch time, around 2ish in the afternoon. We decided to ride back to the campground and I would rejoin the group after lunch. I put on my best supermoto face and hightailed it back to where I thought they were with the plan to catch them from the rear. I hit the trail and saw their tracks. I did not catch up with them until after the pavement at a Church parking lot. I stopped and we all talked about our experiences. There was 1 hour of daylight left and I made a suggestion to do one last dirt loop heading back. Half of us agreed to do it, the other half elected to go back to camp. With a smaller group now, things really got interesting. The dirt had dried up some throughout the day and things were just a slight bit tackier. That and we were becoming more accustomed to the conditions. Things quickly became spirited as we rode along and down the mountain. A flooded creek crossing got everyone excited and then came the hill climb. Jerry took off and I followed, passing shortly later. This was to become the norm the rest of the ride. We were in the zone, grooving along, dancing up the mountain. One would pass and then another with each passing and changing positions in a very fluid manner as we each picked different lines. At one point, it was like a herd of deer jumping fences as one, and then another bike went airborne one after the other as we were truly flying along. This set the tone. As we came to the last intersections, smiles were all a mile wide and laughter was all around. After a short break, I took off with Chris behind me and we raced in the encroaching darkness all the way across the state line back to pavement. I should not have been going as fast as I was but, I was “feeling” it. You know that feeling, of being completely in the zone, pushing yourself to the outer limits but not going past. Truly exhilarating stuff! Note: As the group photographer, I was completely absorbed in leading the ride, riding, taking videos of the shenanigans and only took 1 shot all day, the group shot before the ride (see below). However, we had over 7 cameras rolling footage and David is creating a fantastic series that we will have a link to shortly so check us out on Facebook (Lets Take a Ride) or here for updates, photos and video clips of the ride. Finished video will be available on Vimeo and I will update this post at that time. What an awesome weekend with Top Shelf people to hang out with ... What a RIDE! I've washed my bike twice and its still not clean ... HA! Mofo Flake and JonBu like this. I think we will get about six in this year and from there see if we want to keep it going next year. The ride is definite! ... Spending the time to film and share, I really hope so! It's a passion, I like doing it. I'd like to add that all 950 SE roosting was unintentional in your film. Had I known that you guys were filming the whole time, it would have been intentional! I'm looking forward to the next outing! I'm hoping you can make it to the Catoosa WMA group ride! It was good to finally meet you and ride with ya!